Whether to avoid government surveillance, torrent files, or just unblock Netflix shows only available in other countries, in Germany VPNs have become quite popular. This article will discuss why people in Germany ought to use VPNs, and we’ll recommend the best VPNs in Germany to choose from. ExpressVPN Our #1 choice for Germany. Secure and super-fast servers. No logs kept on browsing activities. Apps are easy to use and secure. Includes 30-day money back guarantee. NordVPN Budget veteran provider with over 10-years experience and one of the largest networks of servers. Good speeds. CyberGhost Great value network with apps that are easy to use, even for beginners. Impressive server speeds. IPVanish Apps are remote control friendly which makes this a favorite with Kodi users and torrenters. StrongVPN Secure and private service, but may need manual configuration. Why use a VPN in Germany? Germany has some of the best pro-consumer data protection laws in the world, but the 2013 Snowden revelations revealed a number of reasons why German residents might still want to consider using a VPN to access the internet. The country’s top foreign intelligence agency has cooperated with the NSA in the past, and the government has tried to implement data retention laws. Germany also has clear-cut rules that make P2P filesharing of copyrighted content illegal. Internet service providers in the country will work with law firms to target torrenters, for example. What’s not so clear is the country’s fair use policy, which would allow limited educational or artistic use of copyrighted material without permission. This is another reason to consider using a Virtual Private Network (VPN). A VPN service encrypts all of a device’s traffic and routes it through an intermediary server in a location of the user’s choosing. This prevents public wi-fi hackers, internet service providers, and government agencies from snooping on traffic. It can bypass censorship, be it at an office or national level. Plus, a VPN connection will mask the user’s IP address, hiding their identity from websites and apps and unblocking geographically restricted content like Netflix and other media streaming services. 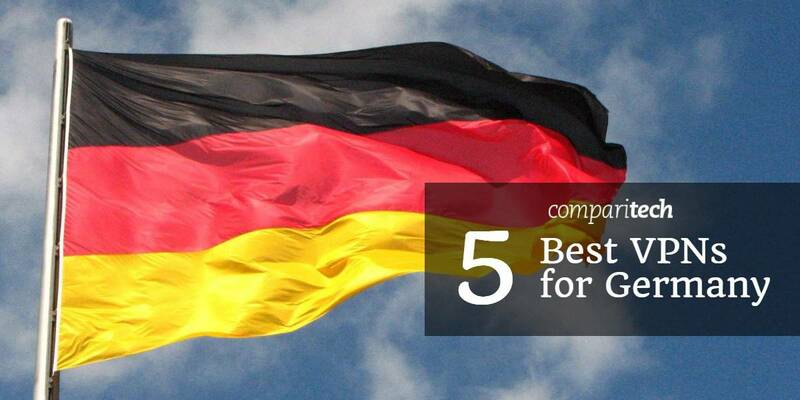 ExpressVPN tops our list as the best VPN for Germany for many reasons. It does not log any traffic content or the source IP of its users. It relies on the OpenVPN protocol by default, and secures it with industry-best encryption, authentication, perfect forward secrecy, and a built-in kill switch. The latter acts as a backup by killing the internet connection should the VPN connection drop. This VPN provider reliably unblocks Netflix catalogs from several other countries, as well as other streaming services like Hulu and BBC iPlayer. You can chat the company’s 24/7 live support team to ask which servers work with which services. Slick, easy-to-use apps are available for Windows, MacOS, iOS, Android, Linux (command-line), and some wifi routers. BEST VPN FOR Germany:ExpressVPN is our top choice. Unblocks most major streaming services with ease. Great speeds for buffer-free HD viewing. Top security and privacy performer, they keep no logs of your online activities. 24/7 live customer service. Try it risk-free with the 30-day money back guarantee. Read our full ExpressVPN review. NordVPN ticks all the boxes for its true zero logs policy, 256-bit AES encryption, built-in kill switch, and support for the OpenVPN protocol. It even goes the extra mile by adding in extra features like double VPN, Tor over VPN, anti-DDoS servers, and servers optimized for ultra-fast streaming. It’s great at unblocking geo-locked content, too. You can look up which servers to use for sites like Netflix, BBC iPlayer, and Hulu on its website knowledge base. A single subscription to this VPN service nets you up to six simultaneous connections. There are apps for Windows, MacOS, iOS, and Android. BEST BUDGET VPN :NordVPN provides great value. A good budget all-rounder that also works well in Germany. Strong security features and accommodates up to 6 devices. Includes 30-day money back guarantee. Read our full NordVPN review. CyberGhost is a Romania-headquartered VPN that’s recently changed hands and ramped up its service in almost every way. The number of servers has exploded from just a few hundred to more than 3,000 and still growing. This VPN provider stores no logs containing personally identifiable information and doesn’t record any of your online activity. 256-bit AES encryption envelops the OpenVPN protocol. Servers performed well in our speed tests, and the company recently added some locations that can unblock streaming services like Netflix. You can even choose a VPN server based on the streaming service you wish to unblock. Apps are available for Windows, MacOS, iOS, and Android. GREAT VALUE:Cyberghost is easy to use. Great privacy and security. Reliable in Germany but can struggle with some popular streaming sites. 45-day money back guarantee. Read our full CyberGhost review. IPVanish is one of the few VPN providers to own and operate all of its own servers around the world rather than leasing them. This means your data passes through fewer hands, and it does so without traffic or metadata logs. This is an ideal VPN for torrenting and is popular with Koid users too. Military grade encryption and authentication are par for the course. IPVanish isn’t as capable when it comes to unblocking Netflix and Hulu, but does make our list of the Best BBC iPlayer VPN options and works for most other streaming sites. Apps are available for Windows, MacOS, iOS, and Android. UP TO 10 DEVICES:IPVanish works with up to 10 Connected devices. Great for families and multiple connections. Apps for most platforms. Look elsewhere if you need to unblock Netflix or Hulu. 7-day money-back guarantee. Read our full IPVanish review. StrongVPN maintains a no-logs policy for both traffic contents and metadata. A wide range of protocols are available, OpenVPN among them. Uncrackable 256-bit AES encryption is used by default. It’s one of the few VPNs working with Hulu and Netflix in a web browser. Support agents are available around the clock to help with any issues. StrongVPN offers unlimited bandwidth and no data caps. We’re not crazy about the desktop app design, but apps are available for Windows, MacOS, iOS, and Android. Speeds were OK during testing but not great on the whole. Very RELIABLE:StrongVPN has no data caps. Servers are mostly focused on US content. Manual configuration can be daunting, but private, secure and reliable once you get it working. 45-day money back guarantee. Read our full review of StrongVPN. UK-based HideMyAss has logged identifying information in the past that led to the arrest of at least one of its users. We don’t recommend VPN providers that log such information to people who value their privacy. Hide.me ranks highly in Google results when searching for „Germany VPN“, but it’s free version limits speed to 3Mbit/s and caps data at 2GB. It doesn’t support OpenVPN, and free users are limited to three VPN server locations. The provider’s premium plans aren’t so bad, however, and the service does not store traffic logs. Note the paid version isn’t so bad. Check out our Hide.me review. ZenVPN doesn’t store logs of the web pages you visit, but it does log your IP address and other information about you and your device. The paid version is limited to 5GB per day. Can I use a free VPN in Germany? Free VPNs are very commonplace in the industry and can be tempting, especially if you’re on a tight budget. However, these services come with a host of issues. For one, a free VPN service will typically be slower and less reliable than a paid option. What’s more, some providers of free services don’t take customer security and privacy as seriously as they claim to. After all, they need to make money somehow, and this is often done through the exploitation of users. A free VPN provider might track user activity and sell profiles to third parties. Overall, it’s definitely worth a few bucks a month for a paid option. Germany’s Federal Intelligence Service (BND) is known to have cooperated with the United States National Security Agency (NSA) in spying an surveillance efforts in Germany. In 2014, a BND employee was arrested for handing over secret documents to the NSA, and WikiLeaks later published a trove of leaked documents on the two agencies‘ cooperation. Reports estimate that the BND collects 220 million sets of metadata per day. This metadata contains information about communications that travel over phone, satellite and internet networks. They record who, when, where, and for how long someone communicates. The German government has pushed for data retention laws to be enforced in recent years. The obligations were suspended in 2017, but if they were put in place, provisions would require all telecommunication and internet service providers to retain user metadata for up to ten weeks. That includes your IP address, when you use a mobile or landline phone, send or receive text messages, download or upload anything, send emails, and browse the web. This does not include the actual content of internet traffic or phone conversations, however, text messages would be retained in full. Content data, as opposed to metadata, is protected by the German Bundesdatenschutzgesetz (BDSG), a federal data protection act. Germany has no laws requiring firms to implement backdoors or submit to gag orders. Torrenting copyrighted material in Germany is generally considered illegal. Doing so can result in fines and law firms (read: copyright trolls) monitor popular torrents for German IP addresses. The law not only applies to the traditional sort of torrent you get from ThePirateBay or KickassTorrents, but also to apps that leverage torrents to stream video like Popcorn Time and websites containing infringing content like Couchtuner and Project Free TV. We do not condone or encourage piracy, but we understand some users might want to download copyrighted content from a P2P network for educational or artistic purposes. We support reasonable fair use, but German ISPs and copyright trolls will likely not distinguish between pirates and artists/educators. For this reason, it’s highly recommended that anyone who uses P2P filesharing in Germany connect to a VPN first. Using a VPN service for torrenting will mask your IP address from copyright trolls and encrypt traffic so it cannot be monitored by the ISP. Read more in our article on the safety and legal aspects of torrenting and what to do if you get caught and see our list of the best torrenting VPN options. 1 Why use a VPN in Germany? 14 Can I use a free VPN in Germany? 9 Can I use a free VPN in Germany?